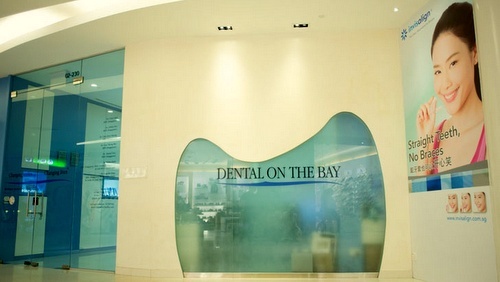 Dental care clinic Dental on the Bay has two locations in Singapore, one at VivoCity (1 HarbourFront Walk) and another within The Shoppes at Marina Bay Sands (2 Bayfront Avenue). Dental On The Bay is a dental clinic dedicated to providing you with highest quality dental care services. To achieve this, in addition to the experienced, professional staff and comprehensive, personalized service, the clinic is equipped with state-of-the-art technology (such as E4D Dentist System and Astratech Implant System), providing remarkable results. Categories of dental care available at Dental on the Bay include implants and restorative dentistry, aesthetic dentistry, Invisalign, pediatric dentistry, CAD/CAM dentistry, as well as general dentistry. In Singapore, some of the popular specific dental treatments include Invisalign teeth straightening (as an alternative to dental braces) and Zoom in-office teeth whitening. Dental on the Bay’s official Facebook page is available at www.facebook.com/Dental-On-The-Bay-285543414812027. The Facebook page is a great resource of additional information about the available dental care services, Dental on the Bay’s events, and other news related to the clinics.